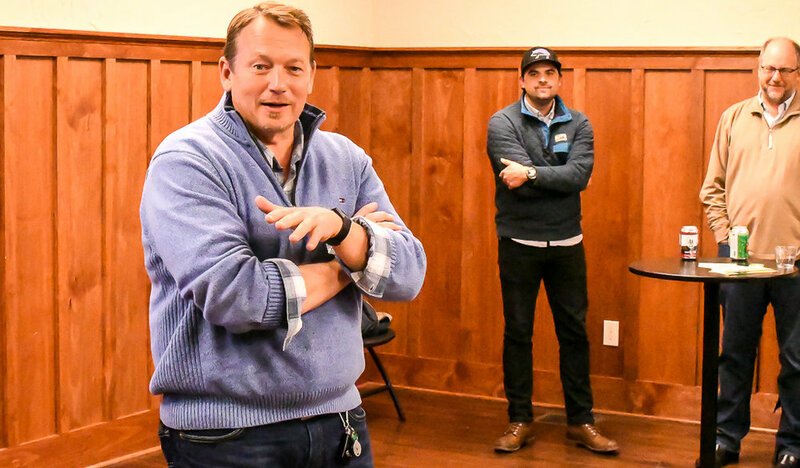 Last Thursday, December 6th, 65+ local entrepreneurs, community members, and business owners gathered at the American Legion in Blowing Rock for the Silicon Hollar Year End Community Celebration! The night started with open networking, drinks, pizza (Carolina Pizza Co.) and cookies (Appalachia Cookie Co.). Because of our awesome drink sponsors we had beer, cider, wine and mead flowing all night long! Thanks again to our monthly drink sponsors, Appalachian Mountain Brewery, Blowing Rock Brewing Co., Booneshine Brewing Co., & Lost Province Brewing Co.
Sam Glover, Co-Founder of Startup High Country opened us up with a quick overview of special guest speakers and by thanking our drink, food and raffle sponsors. Christy Hemenway from Run Amok Mead took the floor to discuss her new business adventure coming soon to a mountain near you and a Mead Label Art Contest that is underway now! Learn more here. Everyone enjoyed sampling the Mead at this event as well! Doc Hendley, Founder of Wine to Water (WTW) was next up to the floor to discuss the work his local nonprofit does worldwide to help provide clean drinking water for all. Doc explained several different ways to get involved and support the cause. An easy way to support the efforts of Wine to Water is to grab some food or drinks at Ransom in downtown Boone and support WTW through their cost-sharing efforts! Everyone enjoyed Wine to Water wine at the celebration as well! Jeffrey Scott, Founder and Facilitator of Velocity Labs then took the floor to discuss his recent 12 week startup course and Cohort 1. With the recent NC IDEA grant funding Startup High Country received, there will be a Spring Velocity Labs course in 2019! Stay tuned for details! Four startup businesses from Velocity Labs Cohort 1 pitched their business idea or venture to the room. Jeremy Bollman Co-Founder of Hatchet Coffee pitched first. Jeremy discussed problem solution fit along with customer discovery, validation and creation. Hatchet Coffee hopes to grow and expand into other markets in the future. Jeremy also said he learned more about company building and leadership development from the Velocity Labs 12-week course. Next up was Courtney Baines, Executive Director of local nonprofit Blue Ridge Women in Agriculture (BRWIA). During the course, Courtney focused on the High Country Food Hub, a project of BRWIA. She was able to track significant customer growth in a year and has worked on new marketing initiatives to promote shopping and supporting local food and artisan products in the High Country. Holly Denise, Founder of SilverBarre pitched next. She was able to find a good customer market for her education product here in the High Country. Holly pivoted and changed ideas several times throughout the 12-week course but is now ready to implement her first SilverBarre class. The last pitch was from Brandon Hall, Co-Founder of ChurchLearn. His team discovered that churches need a volunteer workforce and software to train the volunteers. They have a huge target market and are already reaching out to churches all over the US. Our last speaker of the night was special guest Thom Ruhe, President/CEO of NC IDEA. NC IDEA is a private foundation that has their own money and flexibility to take risks in the market. NC IDEA provides grants and programs to help and promote entrepreneurship and customer validation. He and his team are always trying to figure out ways to get people capable of entrepreneurial and critical thinking. Thom discussed how local entrepreneurs and companies are now competing with kids in other countries, therefore we have to show resilience. Ruhe said, “Not being able to think entrepreneurially is the new illiteracy.” We must try to redefine the ecosystem innovation. Our team is grateful for the outstanding support and attendance at this event! Thanks for always supporting our entrepreneurial efforts here in the High Country. Stay tuned for information regarding our January Startup Social. Check out these images below from David Rogers of Blowing Rock News. Entrepreneurs may spend years gaining experience and resources as they wait for the right time to finally take the leap and start a company. As it turns out, entrepreneurial hopefuls might be able to achieve their aim of founding a business years sooner — if they live in the right place. A new study from LendingTree reveals which 10 major cities in the U.S. have the youngest business founders. Using anonymized data from business owners seeking funding through the LendingTree small business marketplace, the study compared ages of business founders on their companies’ dates of origination in the 50 largest U.S. cities. Average founder’s ages when starting their business ranged from 37 to 42 years old, the study found. This five-year gap in average ages might seem small, but it can represent many factors that work for — or against — entrepreneurs in each city. Here are the 10 cities where young entrepreneurs are making their mark and forming the next wave of million- and even billion-dollar businesses. Gen Xers helmed nearly 42% of new businesses founded in the last five years, followed by millennials who founded almost 38%. Louisville, Ky. had the highest proportion of millennial founders, at 44.8%. Providence, R.I. and Philadelphia had the highest proportion of Gen X founders, at 48.7%. Baby boomers founded more businesses in Silicon Valley (San Jose, Calif.) than anywhere else, at 24.1%. As one of the most expensive communities in the country, it may take budding entrepreneurs longer to save up starting capital. The 10 cities with the youngest entrepreneurs are likely to have some of the lowest barriers to enter entrepreneurship. The area known as “Silicon Slopes” encompasses the Salt Lake City metropolitan area and nearby cities; it is home to billion-dollar tech companies such as Overstock.com, PluralSight and Qualtrics. These big players have helped established a steady, growing economy in Salt Lake City and throughout Utah. The area also has an established (and growing) pool of qualified talent. Combined with the relatively low cost of living, and entrepreneurs in Utah have few obstacles — and plenty of opportunities. In Buffalo, the typical business founder is just 37.9 years old, and a decent portion of the city’s entrepreneurs belong to Generation Z (3.6%). Buffalo’s business climate has improved in recent years, thanks in part to a billion-dollar economic development package proposed by Gov. Andrew Cuomo in 2012. This money has since flowed into the state’s second-largest city, and Buffalo has seen some gains from the program, even in the wake of some false starts and scandals. On top of the “Buffalo billions” initiative, this city offers a relatively affordable cost of living and a strong support system for budding entrepreneurs. This includes business education and support through the Center for Entrepreneurial Leadership at The State University of New York at Buffalo, and local business incubators like Launch NY and 43North. Not only is New Orleans a cultural giant, it’s also a standout when it comes to cultivating the next generation of entrepreneurs and startups. A hallmark of New Orleans’ business landscape is the annual New Orleans Entrepreneur Week. Started by entrepreneurship-focused nonprofit Idea Village, this major event gives would-be founders a chance to learn, grow and even pitch their business ideas. Oklahoma is the last city that can boast an average founder age under 38 years old, and it’s also the city among the top 10 with the largest share of millennial founders, at 43.7%. The average age of founders in this rapidly growing city is 38.21. In 2017, most of the $1 billion in venture capital raised by North Carolina entrepreneurs went to Charlotte-based companies. The flow of money into new Charlotte businesses is just one sign of the city’s healthy startup ecosystem. Another is Charlotte’s large cohort of Generation Z entrepreneurs: a full 5.0% of Charlotte’s business founders fell into this college-aged (or younger) group. This could be thanks to the support and influence of UNC Charlotte’s Ventureprise entrepreneurship program, which provides business resources, trainings and certifications to students and Charlotte community members alike. Entrepreneurs are able to get a headstart on their startup goals in Minneapolis, where the average age of a business founder is 38.7 years old. The costs of starting a business here are kept low, thanks to the competitive living costs in the area and attractive tax incentives such as “angel tax credits,” which provide up to $1 million in for new, tech-centered businesses. Minneapolis-based events, like Twin Cities Startup Week, can also give local entrepreneurs and businesses the perfect venue to network, promote and pitch themselves, and even raise capital. Another local initiative is the MN Cup, a statewide startup competition sponsored by the University of Minnesota — since its establishment, it’s seeded $2.4 million to local businesses. Female entrepreneurs should also check out Women Venture, a local small-business nonprofit that helps women start and grow businesses in Minneapolis. For young entrepreneurs, St. Louis provides a fertile environment in which business ideas and entrepreneurial ambition can grow — that’s thanks to a strong local startup scene and robust support network for new companies. Local business investment foundations such as the Missouri Technology Corporation, Arch Grants and St. Louis Accelerator provide vital investment and grant dollars to attract and grow leading young businesses. These are just a few of the incubators, accelerators and initiatives that provide enough support to young entrepreneurs to allow a typical founder to start a business as young as 38.8 years old. When inspiration strikes, young entrepreneurs in Portland, Ore. aren’t afraid to strike out on their own. But they don’t have to go it alone, thanks to incubators and accelerators such as Prosper Portland, Portland Incubator Experiment (PIE) and Portland Seed Fund. The average founder in Portland is just under 39 years old. Home to campuses for leading brands such as Nike, Columbia Sportswear and Intel, Portland and the state of Oregon offer business-friendly corporate tax structures. New entrepreneurs should investigate tax incentives that can help lower their new business’ property and income taxes. The secret for Milwaukee’s young entrepreneurs, just under 39 years on average, could be the city’s low costs for businesses. Milwaukee’s lower cost of living combines with attractive tax incentives, exemptions and credits to make it more affordable for founders to start and ramp up a new business. Entrepreneurial hopefuls can find plenty of backing in the Milwaukee area. Startup Milwaukee, for example, provides education and networking through Milwaukee Startup Week and similar initiatives. BizStarts offers further resources for local entrepreneurs, while other incubators like Milwaukee 7 can provide capital and funding for young companies. Last on the list is Austin, the only city on this list in which the average new business founder is over age 39. From hosting innovation-centric conference South by Southwest (SXSW) to a booming local economy, this fast-growing city is a hub of entrepreneurship in Texas. Several startup accelerators and incubators in Austin can help local founders grow a business at an stage. A bevy of newer venture capital firms in the area, like ATX Seed Ventures and LiveOak Venture Partners, could be spell good news for young businesses hoping to attract funding. If you’re hoping to become a full-time entrepreneur, you’re not alone. Nearly a third of Americans have thought about starting their own businesses in the past year, according to a recent LendingTree survey. Before launching a business, however, it’s worthwhile to consider your location and how friendly it would be to a new and growing company. The better the location you choose, the faster you can work toward founding and building your business. Growing local economy: A startup will need a healthy economy and other businesses to survive. Check key economic indicators in cities you’re interest in — low unemployment and high consumer confidence in your area are positive indicators of a healthy economy with room for new companies to take root. Business-friendly tax policies: Among the top 10 cities, a common thread is business-friendly tax policies. Many of these cities charged lower taxes to local businesses, and some even provided tax incentives to attract new and expanding companies. Low cost of living: With lower expenses, you’ll need less capital to get your business up and running. These low costs can also keep your bottom line growing faster and keep your new business lean and competitive. Strong startup network: Most of the cities with the youngest entrepreneurs were also home to robust support systems and networks for new entrepreneurs and startups. Research your area of interest to see if it’s home to business incubators or accelerators, entrepreneurial networks or events or even a coworking space. Your local Chamber of Commerce or Small Business Administration office can be a great starting point to find business resources and organizations. Availability of business funding: Lastly, research opportunities you might have to access or raise funds for your business. See if your city of interest is home to venture capital firms or programs that offer small business grants or other funding. Check out potential sources you could turn to for small business loans, too. Being picky about finding the best place to start your business can really pay off later. This study shows that a good balance of low costs and a strong startup ecosystem can help young entrepreneurs found a business years earlier. Even better, these factors can set a new business up for continued success in the quarters and years to come. Anonymized data of borrowers seeking business loans on the LendingTree platform was limited analyzed to determine the average age of business founder in the 50 largest metropolitan statistical areas (MSAs). The data was limited to businesses founded within the last five years, and founders’ ages are from the date they founded their businesses. Generations are defined by the Pew Research Center as follows: members of the Silent Generation were born between 1928 and 1945; the Baby Boom generation between 1946 and 1964; Generation X between 1965 and 1980; the millennial generation between 1981 and 1996; and Generation Z after 1996.